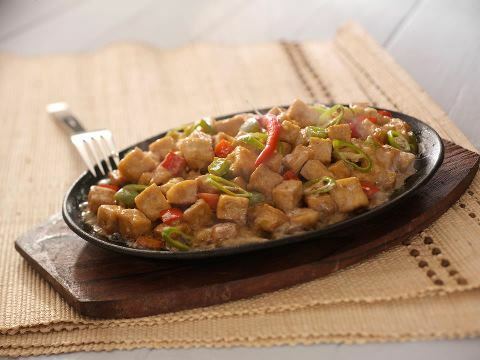 Tofu cubes with chopped onions, red and green bell peppers glazed with a special sauce topped with chilies. This dish is slightly spicy, which added to its already flavorful taste. If you like sizzling food and is a bit health conscious, then this is a must try. 1 Heat oil in a deep pan. 2 Cut up the Chinese tofu into cubes and fry in hot oil until golden brown. Drain in paper towels. 3 In a bowl, combine mayonnaise, oyster sauce, sugar, parsley, and pepper. Mix well, and add water until desired thickness is achieved. Adjust taste accordingly. 4 Heat the mayo mixture in low heat while stirring for two minutes, then add the bell pepper and continue stirring for one more minute. 5 Take your heated sizzling plate and add a small amount of vegetable oil. 6 Saute garlic and onions until cooked, add in the tofu and mayo dressing and mix well. 7 Sprinkle with sliced finger chili and more onions.